While a pass in the Talkeetna Mountains carries his name, Robert Lee Hatcher's bones rest in an unmarked grave, and his contributions to mining in southcentral Alaska are generally unknown. After 100 years, it is time to recognize him for his role in the discovery and development of the Willow Creek mining district and in other mining developments in the Talkeetna Mountains and Kenai Peninsula. Hatcher made several of important discoveries in the Willow Creek district, where he developed mines and roads. His discovery of the Skyscraper Vein was the first lode or hard rock discovery in a district that, until then, was a rather marginal placer district. His prospecting career lasted into the 1940s. In 1939, Hatcher joined with other pioneers to organize the Alaska Miners Association in response to new federal legislation on wage and hours. Perhaps his most unusual claim to fame, however, was his marriage to Cornelia Templeton Jewett, who led campaigns for voting rights for Alaska women and the prohibition of liquor in the territory. Hatcher sold one-fourth interest in his quartz-gold ledges to Knik merchant and placer miner Orville George Herning for less than $1,500, payable half in cash and half in grub. On September 22, 1909, Hatcher and his partner, J. H. Carnegie, used the back of an envelope to deed three-fourths interest in five Skyscraper claims - the 'North Homestake,' 'South Homestake,' 'Tom Boy,' 'Smugler [sic.] Union,' and 'Skyscraper lode claims' - to F.G. [Frank Guiliaem] and W.E. [William Earl] Bartholf for $6,000. The Bartholf brothers had two years to make four specified payments to the Bank of Seward to finalize the deal.3 Hatcher and Carnegie's $7,500 proceeds from their claims would be nearly a quarter of a million in today's dollars. Later, the Skyscraper claims were leased and developed by William "Billy" Martin, who managed the Alaska Free Gold Mining Company. Hatcher and Carnegie's claims, and those on strike across the gulch on Granite Mountain filed by the Bartholf brothers and operated by J. S. Carle, were combined and operated by Milo Kelly from late 1911 to 1914. Together, the claims became the basis for the Independence Mine developed in the 1930s by the Alaska-Pacific Mines, Inc. Today, it is the Independence Mine State Historical Park. Three years after his 1906 find, Hatcher discovered more quartz veins a few miles away near the headwaters of Archangel Creek, a tributary of the Little Susitna River. Named the Matanuska, this important discovery was also known as the Talkeetna Mine. Along with a 1913 Hatcher find in the same area called the Little Gem or Hatcher's Prospect, the Matanuska Mine later became part of the neighboring Fern Mine operated by Thomas McDougal in the 1930s. The Fern was one of the most important mines in the district; engineer William Stoll estimated its total production at about 44,000 ounces of gold. 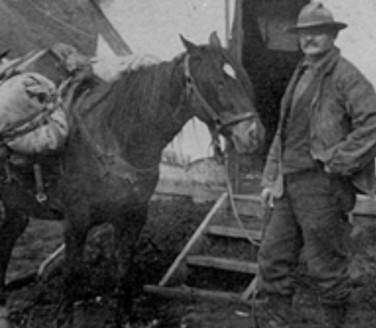 McDougal, who would be Hatcher's partner in Nuka Bay in the Kenai area, was known as "a canny gold-mine operator - one of the most successful in the district. "4 Heralded as a ten-foot vein of free gold-quartz, Hatcher's Matanuska Mine on the Fairangel Creek in the Talkeetnas was big news the summer of 1909, when Hatcher turned his Willow Creek mining district claims over to Frank Watson, one of the locators of the Matanuska coalfields, for development.5 Hatcher left the territory to court a lady. During the 1910 mining season, Hatcher was back in Alaska prospecting on the Kenai Peninsula. There he filed a joint claim with C. A. "Scotty" McPherson located on a butte near Groundhog Creek in the Moose Pass mining district about thirty-four miles out of Seward via the Alaska Northern Railroad. The Hatcher-McPherson Groundhog claim was purchased by a developer from Spokane named Samuel I. Silverman who established the Seward Gold Company, and sold stock in the enterprise to local citizens and visitors including stewards from steamships docking in Seward. Less than a year after Hatcher and McPherson sold their mine for $30,000, the Seward Gold Company sold it to a British syndicate for $225,000 in installments. But, as sometimes happens, the gold disappeared. "Before the first payment fell due [on the Seward Gold Company Mine] . . . the ledge pinched out and the mine was abandoned. "6 Still, Robert Lee Hatcher was changing his life. In 1911, at age forty-four, Hatcher married a forty-four year old nationally known woman's rights and prohibition leader, Cornelia Templeton Jewett of Chicago, whom Robert Lee met while she was on a tour of Alaska after attending the Alaska-Yukon-Pacific Exposition in Seattle in 1909. While Robert Lee was a secretive man due to the nature of his prospecting work, Cornelia was a public woman who gave speeches, wrote articles, and ended up on the front page of newspapers. This marriage of prospector and reformer allows us to know about Robert Lee Hatcher, the man, because Cornelia wrote about their Alaska adventures and took numerous photographs of their mining operations. She left us a full photo record of Hatcher's Gold Mint Mine effort in the Willow Creek district and commissioned Alaska's famous artist Sydney Laurence to do a painting of the Hatcher Relay Station on the Sustina River. After their marriage, Robert Lee went on to make other major strikes in the Willow Creek district and on the Kenai Peninsula. While Hatcher regularly leased or sold his gold claims for others to develop, he would work two mines in the Talkeetna Mountains himself - the Matanuska, also known as the Talkeetna, mine from 1911-17, and the Gold Mint, also known as the Lonesome, in the early 1920s. Later, he prospected and mined in Nuka Bay, southwest of Seward, with Tom McDougal in the late 1920s and 1930s, and worked the Old Gilpatrick mine in Moose Pass area in the 1930s, Hatcher was first and foremost a prospector, with a good eye for quartz veins. He preferred being on horseback or on foot with his dog "Blue", searching the mountains for the next lode strike. During the summer months, the Hatchers and their hired men moved their mining equipment and materials from Wasilla, where they now lived, having moved from Knik when the railroad came through the Valley making Wasilla the transportation center. They would drop equipment and supplies at their Relay Station, at 30 mile in the Talkeetna Mountains, half way between Wasilla and the Gold Mint Mine,8 where they had a cabin and shed. Once the Little Susitna River froze in the winter, they would haul the materials to the mine, where the Hatchers established a camp, and installed one of the six stamp mills in the district. Their Gold Mint Mining Company camp consisted of a log bunk-house and log mess-house and cache, the stamp mill, and four tent houses, one of which was home for Cornelia and Robert Lee. A half-dozen men helped them bring in the stamp mill and pipes for water power from the Lone Tree Creek. Developing a mine was extremely hard work, and both Hatchers were 55 years old. Besides, they weren't making money. While they took out $38,000 of gold (nearly $400,000 in today's dollars) from the Gold Mint Mine, the operation failed. They had invested a total of $50,000 in the mine, camp and stamp mill, both their own money and money loaned money by backers,9 but they "lost the vein." At the end of the summer in 1922, Cornelia left Alaska in poor spirits and bad health.10 After spending time in Detroit getting medical care, Cornelia went to San Diego to enjoy the warm weather, and to take a course to prepare herself to be a hairdresser. Two years later, Cornelia officially ended her Alaska adventure. Relocated in Long Beach, California, she resigned as president of the Alaska Woman's Christian Temperance Union, and Robert Lee disposed of her piano by selling $2 raffle tickets. He closed the Wasilla house and ended his career in the Talkeetna Mountains. In the summer of 1943, Robert Lee Hatcher, "the man whose gold discoveries set in motion Independence, Martin, Talkeetna, Jam, Ray Wallace and Gold Mint" mines in the Willow Creek mining district, celebrated his seventy-sixth birthday in Anchorage by announcing yet another gold discovery near Seward. Heralding the new find "as the greatest gold discovery of his career,"12 Hatcher showed his ore samples around Anchorage, but there was little interest in his latest find even though the estimated value was "about seven dollars a ton. "13 A gold mine was no longer a good investment. Gold mines were closing because the United States War Production Board deemed gold mines non-essential to the war effort and ordered them closed during World War II. I am not an expert on mining in Alaska. My major contribution to the history of Robert Lee Hatcher is a better understanding of him as a man through his relationship with Cornelia Templeton Jewett Hatcher and thanks to her great granddaughter, Robin Rustad, bringing Cornelia's photographs of Hatcher and his mining camps back to Alaska. These three scrapbooks are the Cornelia Templeton Jewett Hatcher Papers, 1867-1953 donated to the Anchorage Museum Resource Center and are referred to here as "CTJH Papers." While I used newspaper accounts for reports of Robert Lee Hatcher's gold finds, I relied on mining experts' accounts for analysis. Stephen R. Capps, The Willow Creek District, U. S. Geological Survey Bulletin, 607 (Washington, D. C., Government Printing Office, 1915). Mary J. Barry, A History of Mining on the Kenai Peninsula, (Anchorage: Alaska Northwest Publishing Company, 1973). Rolfe G. Buzzell, 1997-1998 Cultural Resource Survey of Proposed Transportation Enhancements at Independence Mine State Historical Park (State of Alaska: Department of Natural Resources, Division of Parks, Office of History and Archaeology Report Number 69, 1998). Kathryn Koutsky Cohen, Independence Mine and the Willow Creek Mining District, (State of Alaska: Department of Natural Resources, Division of Parks, Office of History and Archaeology, 1982). Dorothy Page, "Old Mines and Miners," Touchstone (Summer 1980): 40-45. A. W. Reeder, "The Willow Creek Mining District," Alaska Sportsman (May 1965 and June 1965): 15-19 and 24-28. Doug O'Harra, "Tunnel of Dreams," in We Alaskans, Anchorage Daily News, 9 October 1994, 9-14. W. M. Stoll, Hunting for Gold in Alaska's Talkeetna Mountains, 1897-1951 (Ligonier, Penn: William L. Stoll, 1997). Ron Wendt, Hatcher Pass Gold: An Historical Guide to the Willow Creek Mines (Wasilla, AK: Goldstream Publications, 1992). A major source of my understanding of Knik and the Willow Creek mining district is the collection of diaries of Orville George Herning, 1900-1947. Herning was the manager of the Boston Gold Mining and Manufacturing Company and owner of the Knik Trading Company that moved to Wasilla after the coming of the railroad. He recorded almost daily notes about the goings on in Knik and Wasilla for nearly half a century. His notes are brief, but they are an excellent source for an understanding of the area and change over time. They are not used extensively because they are difficult to read and considerable knowledge of the place and players is needed for his notes to be meaningful. The original diaries are Orville G. Herning Diaries in Papers, Dartmouth College Library, Hanover, New Hampshire. Typescript copies transcribed by Louise Potter are at University of Alaska Fairbanks Archives and Anchorage Museum Library and Archive. Coleen Mielke is in the final phase of preparing a new, indexed typescript of Hernings' Diaries for publication. The Alaska 1900 census shows Hatcher born 24 June 1867 in Montague, Texas, with father from Tennessee and mother from Missouri and arriving in Alaska 1888. Later, he reported his father from Ohio. The 1900 census shows Hatcher living in Douglas, Alaska, across the channel from Juneau. He died in Seward, Alaska, 24 September 1950 and was buried 1 October 1950 in the Seward Pioneer Cemetery, Seward Seaport Record, 24 and 25 September 1950 and Certificate of Death, Alaska Department of Health Bureau of Vital Statistics. Skagway Alaskan, 12 May 1915 and June 1915. While in Juneau, he filed a claim as the Juneau Eagle River Quartz Gold Mine, Gerrit Heinie Snider, Centennial: 100 Stories of Alaska (Anchorage, Alaska: Color Art Printing, 1966), 137. 2 Capps (1915): 50. "Some say two Japanese [George Yamado and K. Yago] made the first discovery but, as aliens, were unable to record the claim." Cohen: 31-32. 3 Herning, October-December 1907. Knik (and Willow Creek), Miscellaneous Papers, Vertical File, University of Alaska Fairbanks Archives, Fairbanks, Alaska. Herning and the Bartholf brothers were the major placer miners in the Talkeetnas in the early years according to the mining historian of the area. Stoll, 26. Thus, they had the knowledge and the money to see the value of the deal and finance it. 4 Seward Gateway, 31 July 1909; Wendt, 29; Capps (1915): 76; Stoll, 88. 5 Seward Gateway, 31 July 1909. Two companies worked these mines-the Talkeetna Mining Company and Hatcher Gold Mining Company. Cornelia was an officer and stockholder in both. CTJH Papers. 6 Seward Gateway, 9 June 1912; Alaska-Yukon Magazine (November 1910): 320; and Barry, 113. 8 The Relay Station was 15 miles from Wasilla because the markers indicate the miles from Knik. 9 Herning, February 2, 1921. The Gold Mint Mine, also known as the Lonesome Mine, was worked by a number of operators with limited success in the 1930s and 1940s. However, "by 1950 the old prospect was quiet again." Stoll, 258. 10 Notes by Cornelia's daughter in CTJH Papers. 11 Barry, 171-73 and 209. 12 Anchorage Daily Times, 21 June 1943. 13 "From Ketchikan to Barrow," Alaska Sportsman (October 1943): 21. 14 Seward Seaport Record, 29 September 1950. Certificate of Death, September 24, 1950 [Buried October 1, 1950], Alaska Department of Health, Bureau of Vital Statistics. At the time of Robert Lee Hatcher's death, his wife Cornelia was hospitalized in Arkansas where she died two and one-half years later at age 86.